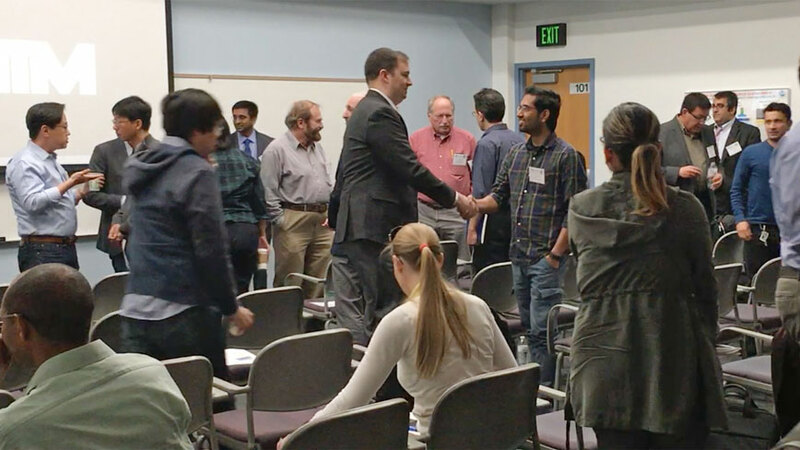 The University of New Mexico’s Center for High Technology Materials (CHTM) held its first in a series of planned "NanoConferences" on Friday, March 31, 2017. 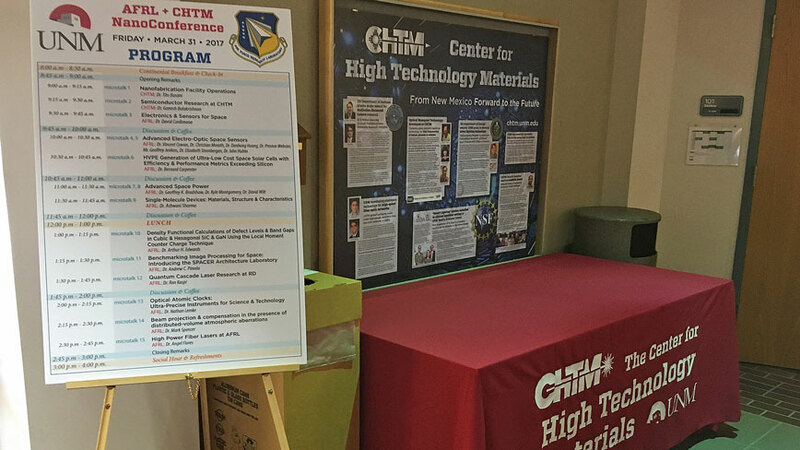 Representatives from CHTM have expressed their thanks to their esteemed guests from the New Mexico Air Force Research Laboratory (AFRL), whose participation produced a very successful and productive event. 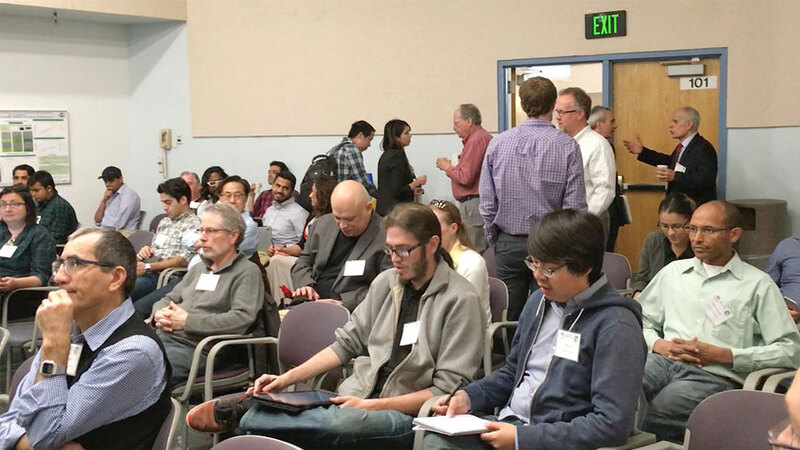 The purpose of the Nanoconference was to create a day's space dedicated to face-to-face discussions of current research projects in order to strengthen the local scientific community. 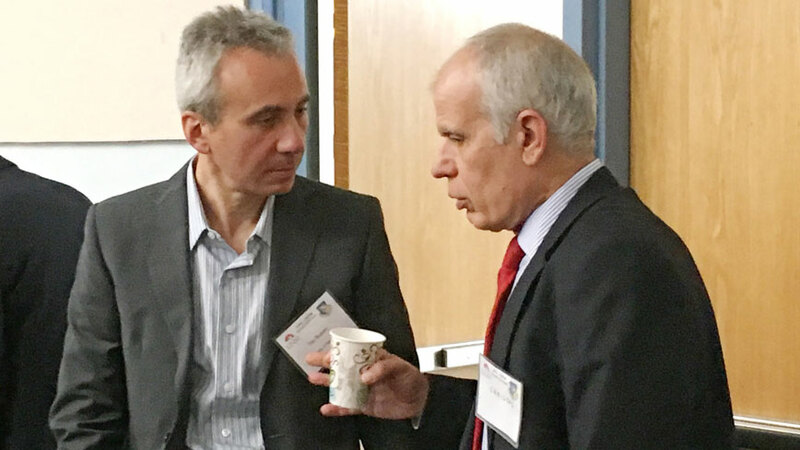 In learning about each others' work, the AFRL scientists and UNM faculty may identify commonalities in the goals of their research and the potential for collaborative partnerships. Every hour consisted of three 15-minute talks followed by 15 minutes of coffee and discussion. As the "TED" talk format has demonstrated, this provides for the overview of a great variety of information from many stakeholders. 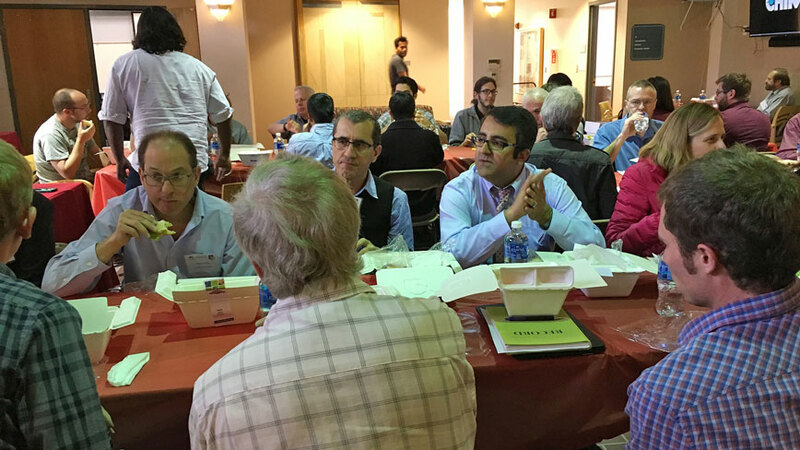 Besides the many enlightening presentations, multiple opportunities for a variety of spontaneous, productive discussions lent synergy to the day's sharing of content. We hope that this event is just the start of getting to know one another, and to create opportunities for greater collaboration and to join our efforts together for greater outcomes. You will learn more about the capabilities of CHTM from our first two speakers, and I think you will be pleasantly surprised at the scope of technical support and scientific expertise that CHTM may offer. The Center is known worldwide for inventing disruptive nanoscale technologies. It is an internationally recognized center of excellence in photonics and microelectronics. 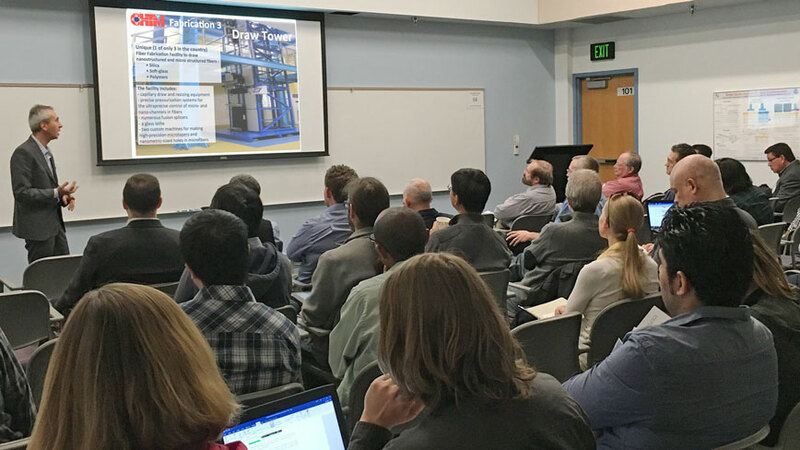 CHTM is one of the few university laboratories in the country that have end-to-end integration from design and modeling, to materials and prototype manufacture. We can support your process from theory and physics; to design and simulation; to crystal growth and characterization; to device fabrication and system integration. CHTM has 60,000 square feet of fabrication, manufacturing and characterization laboratories and a 3800 square foot Cleanroom. It features state-of-the-art capabilities in epitaxy and nanoscale materials; nanoscale lithography and microscopy; photonic and microelectronic devices; ultrafast metrology; fiber optics; and sensing and imaging. CHTM faculty have earned 191 patents to date, contributing 35% of UNM’s portfolio, with 38% licensed for commercialization. This Center is a world-class facility with top talent on hand to support your research efforts. 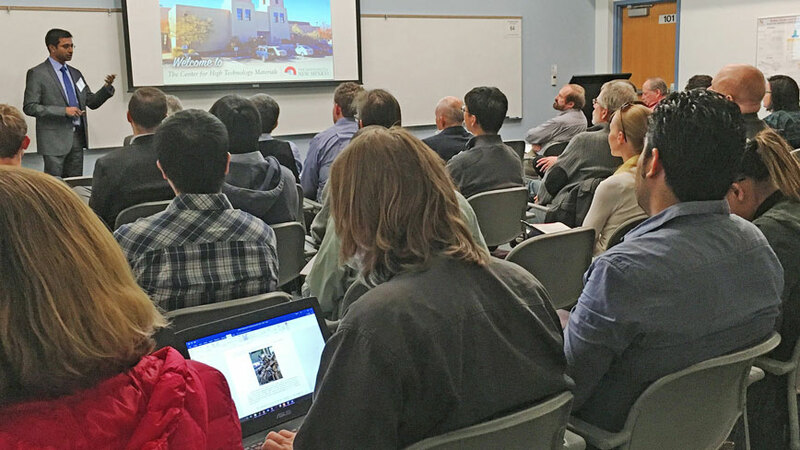 Dr. Christos Christodoulou, associate dean for research and professor (and incoming dean) with the UNM School of Engineering (SOE) also touched on the significance of the CHTM facility to UNM and the local community of scientists. 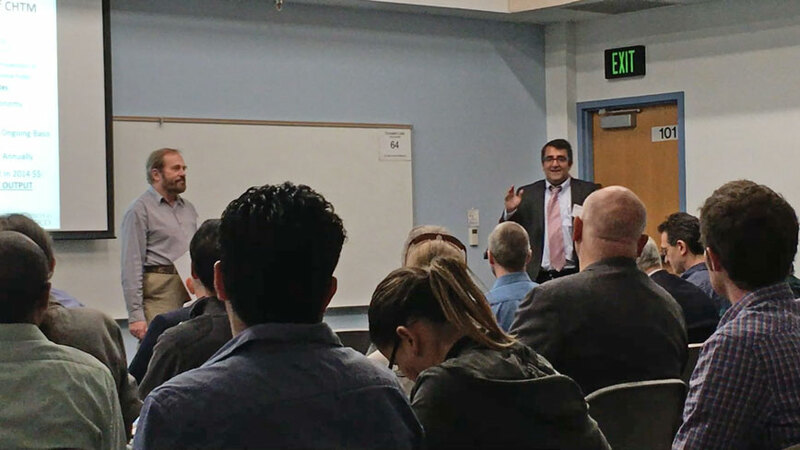 Professor Arash Mafi, interim director of CHTM, introduced the event, and Electrical and Computer Engineering professor Marek Osiñski served as timekeeper and MC. 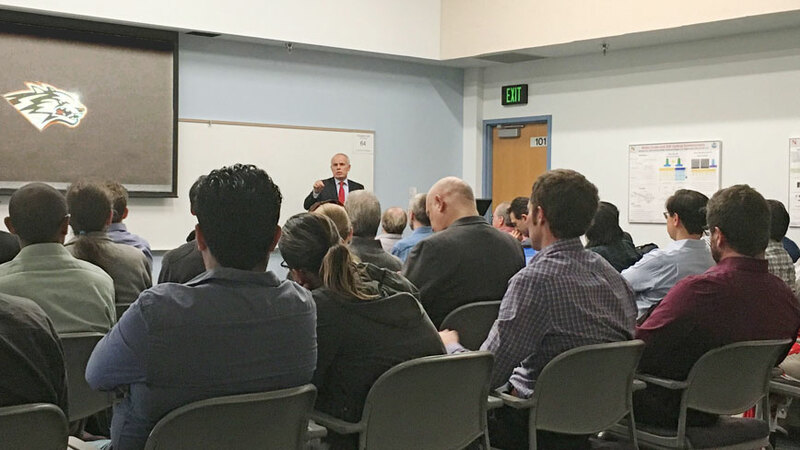 Before the round of presentations by the AFRL researchers began, professor Tito Busani, Nanofabrication Operations Manager at CHTM, covered the capabilities of the CHTM facility in more detail. 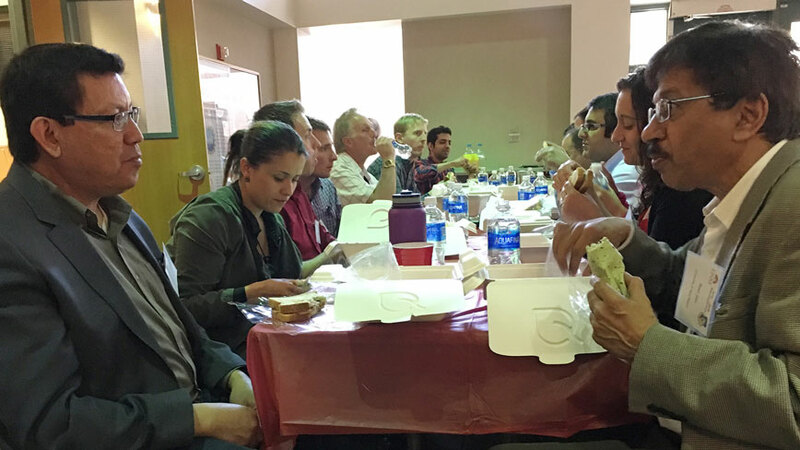 There are many features that make CHTM a unique university facility in the United States. Among the distinctions are a Fiber Fabrication Draw Tower to manufacture custom nanostructured and micro structured fibers of silica, soft-glass and polymers. It is one of only three of its kind in the nation. Busani covered the range of epitaxy, fabrication and characterization capabilities at CHTM. 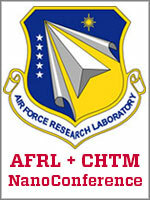 A unique aspect of the support that CHTM offers is the ablity to access the facility for confidential research, or to engage the inhouse talent in the faculty-led research groups in conducting experiments. 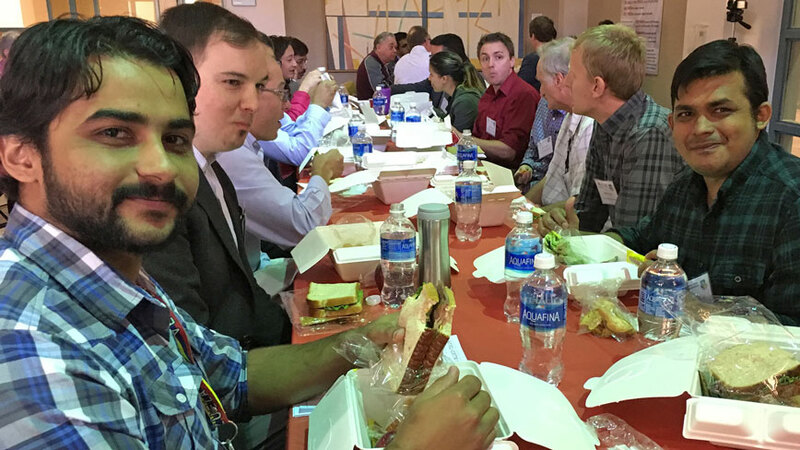 Professor Ganesh Balakrishnan overviewed the semiconductor research taking place at CHTM before the round of presentations by the AFRL researchers began.